½ tsp chilli powder or two small chopped green chillis – leave out the seeds & membrane if they are very hot! Boil potatoes until soft, then drain them and mash well. Chop prawns using a sharp knife until they look minced. Put in a wok. Add mushrooms, ginger, garlic & lemon juice. Cook for 2-3 mins, stirring all the time until the liquid has evaporated and put prawns on a plate to cool. Divide the potato into 10 small balls and make each in turn into a flat shape, with a dimple in the middle. Carefully put about a tsp of prawn filling on, and seal the potato over it. Flatten into a round disc. 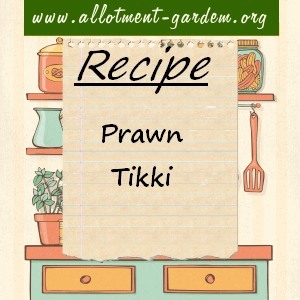 Make each tikki the same. Heat the grill, brush each lightly with sunflower oil and grill, turning once, until golden brown. (You can fry them too, but then they stay together better if dipped in beaten egg first). Gorgeous with large salad and a yoghourt and cucumber raita.